We’ve all had those days before: the day when you’re internally celebrating how well you’ve stuck to your new way of eating and then your thoughtful coworker brings you a box of your favorite cookies from the nearby bakery. You can’t say no, because that would be rude you think, so you swear you’ll just have one today then give them away. Except one cookie turns into five, and one day of indulging turns into a week. If you haven’t seen them yet, check out parts 1 and 2 to learn more about your series of events that lead up to the wheels coming off. Everyone’s series will be slightly different so I highly encourage you to do the analysis from part 2 first to figure out which problem solving strategies below will work best for you. Schedule time: One of the most helpful routines you can get into to set yourself up for success each week is scheduling a 15-30 minute block of time in your calendar to plan your health and fitness events for the week. Look ahead at your other obligations. Schedule in time for things like grocery shopping, meal prepping, and training sessions and have plan B options in case your schedule changes. If you live with others, see if you can split up the tasks or recruit help so that it’s not all on one person’s shoulders. Plan your meals: Decide what you’d like to eat for the week, including when you can have leftovers. Planning it out lets you see when you have gaps without meals scheduled so you don’t have time make a game time decision on a whim. Cook in bulk: It doesn’t take much more effort to double or triple a recipe and it can save you a lot of time each week. Anticipate those sticky spots like when you come home from traveling or will be out late by having meals in the freezer ready to reheat. For example, when I went away for a week, I knew my flight would get back around dinner time and I wouldn’t want to go grocery shopping. In anticipation of this, before I left I doubled a batch of chili in order to have enough for the week and then froze the remainder so that I would have several days worth of dinner when I got home. To help you remain flexible, think progress not perfection, and have alternatives in mind. Online grocery shopping: these services are becoming much more common and accessible, with some stores even offering groceries delivered to your door within two hours. Meal prep/delivery services: If you have the means to do so, and they’re available in your area, there are many different types of these services. They can be great for certain nights of the week that you know are hectic, or even just for certain weeks out of the year when things pile up more than usual. Plan takeout options: Try reading at home the takeout menus of your favorite restaurants, then circle 2-3 options that align with your goals. Don’t be afraid to ask them to modify recipes by baking instead of frying, leaving out certain foods, or swapping out fried foods for an extra serving of veggies. This way you’re not making a decision in the moment when your stomach is growling. You’ll have already marked a few options that you enjoy and help you make progress towards your goals. Sometimes when we shoot for eating “perfectly,” our calorie intake lowers significantly and on top of that, our choices don’t feel satisfying. If you’re under eating by a lot, and the corresponding hunger becomes tough to manage, that can trigger these instances when the wheels come off, undoing the hard won progress through overeating and/or drinking. This could look like restricting stringently for an entire day or more, and the next day finding yourself going all out for dinner with pizza, fries, beer, and dessert. But it could also look like eating a very small breakfast and lunch and then feeling ravenous and overeating around dinner time, aka crescendo eating. An alternative to swinging back and forth between these two extremes would be to eat balanced moderate meals throughout the day using foods you enjoy. Think of the meals you eat on a scale of 1-10. 10 being the most “perfect” meal, and 1 being the least ideal meal you’d realistically eat. What would be a 10/10 meal? How about a 1/10 meal? Sure, that 10/10 meal might be incredibly nutritious and help you to progress faster, but if it isn’t sustainable or enjoyable in the long run and it causes the wheels to fall off, maybe it’s not the “perfect” option for you. Instead, try shooting for somewhere closer to the middle by choosing an option that’s satisfying. Not an option you would have to white knuckle eating for 30 days. If you’re a crescendo eater, you may benefit from spreading your food out evenly throughout the day by adding more to breakfast and lunch so you’re not ravenous by dinner and ready to eat anything in sight. Another solution is to shape your environment as much as you’re able to with a kitchen reboot. Clean out red light foods: This involves getting rid of all the foods that no matter when, where, or how much, they’re hard for you to stop eating. Your trigger foods. If they’re in your house, chances are they will get eaten. Sort through the pantry, fridge, and freezer. Be choosy with yellow light foods: These are foods that you can sometimes eat normally and sometimes overeat. Be discerning with with ones you decide to keep, or make the choice to enjoy them out of the house. If you keep them, make them harder to see and reach. Out of sight, out of mind works wonders. Stock the green light foods: After you’ve cleaned out the kitchen, it’s time to stock it with foods that you enjoy, are nutritious, and are easy to eat normally in any setting. Make these foods easy to see and access. Make nutritious food accessible & visible: Use part of your weekly planned time to wash and chop fruits and vegetables so they’re ready to be consumed or cooked. Keep them out on the counter or at eye level in the fridge and pantry. Store them in glass or transparent containers. Just like Amazon makes it easy for you to buy with 1-click, make it 1-click easy to consume these foods with planning and preparation. Whether you’re going to be in your car all day, on a plane, or going to a friend’s party, it can help to bring food with you if you’re unsure of the options. Bring plane friendly options: Instead of trying to resist the delicious smell of Cinnabon wafting through the airport on an empty stomach, pack a few solid food options that are airplane security friendly. Pack a cooler: Try this if you’ll be in the car for a while, especially if you don’t know what restaurants will be nearby. Nuts, fruit, or protein shakes and bars are also easy to travel with if you don’t have a cooler. Bring a dish: If you’re going to a social event, offer to bring food. Choose something nutritious and enjoyable that you would want to have as an option, especially if you know Gina only serves fried foods or Brian wouldn’t know what a fruit or vegetable was even if it smacked him in the face. Sure, food is fuel, but it’s used for much more than that. It’s a source of micronutrients and phytochemicals. It triggers signals in our body that affect hormones, the GI and immune systems, our DNA and so much more. It affects how we feel. Eating is also a pleasurable experience with cultural ties. You have a history with food. Memories, bonding experiences, and people of impact, good, bad or indifferent, that affect what food means to you and your relationship with it. Food can be associated with guilt, pleasure, shame, indifference, fear, rebellion, control, entertainment, avoidance, escape, or comfort. In essence, emotional eating, and eating for reasons other than hunger, are typically ways to solve problems. In today’s environment, it’s so common and it can work pretty well to help you feel better, however it can become an issue when it contributes to things like unwanted weight gain, GI distress, skin issues, etc. When you decide to change your eating patterns and no longer respond to these situations with food, the issues you were trying to deal with through food are still there blasting you in the face. This can feel extremely stressful if you haven’t developed other ways to address the problems. What you need are alternatives to handle these emotions so that you can surf the feelings of discomfort. Skilled mental health counselors, especially ones with experience in this area, are extremely helpful with these situations. They can take into account your past experiences, thought patterns, and goals then talk through specific skills and techniques, using methodologies such as cognitive behavioral therapy, to address unwanted behaviors such as emotional eating. Tolerating discomfort: Before you take a bite, pause and see how long you can tolerate a bit of discomfort. Decide on a certain amount of time before the moment occurs. Maybe it’s ten minutes...maybe it’s one minute. Whatever the time is, distract yourself with a different activity and delay eating for the set amount of time. Eat the food after the time is up if you still want it. Gradually increase the time each week or two, getting more skilled at tolerating discomfort with each instance. Mind-Body Scan: This mindfulness technique can slow down a racing mind and help you feel more grounded in your body. This can take as little as five minutes, however feel free to do this for longer if desired. Find a comfortable position, either sitting or lying down, and establish a rhythmic breathing pattern. Inhale slowly and deeply through the nose, as if you are trying to fill your pelvis up with air. Exhale slowly through the mouth. Starting at the crown of your head and working your way down to your toes, observe objectively how each area of your body feels. Are your muscles tight or relaxed? Are you clenching your jaw, elevating your shoulders or squeezing your glutes? Do you notice any sensations on your skin? Next, try the same observational technique but with your thoughts and emotions. What are you feeling? What’s running through your mind? Do you notice any patterns between your observations and your eating habits and desires after trying this out for a few weeks? I hope these options have sparked some helpful problem solving ideas. If you’re having trouble implementing solutions consistently and successfully, consider seeking out nutrition coaching. A good coach will meet you where you’re at as an individual. They’ll not just listen and work WITH you to help troubleshoot these situations, they’ll also support you, encourage you, and provide accountability to help you get closer to the results you want. Ready to become a healthier, stronger and fitter version of you? 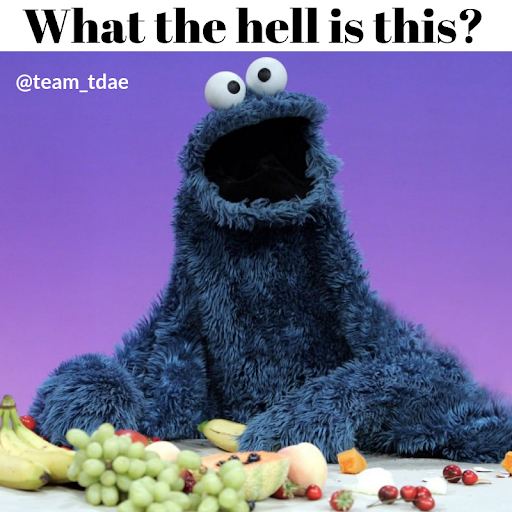 Learn more about TDAE Nutrition Coaching HERE!